Most American history books are about the decisions and actions of legislators, kings, and generals, each representing their political entities, regions, or classes. 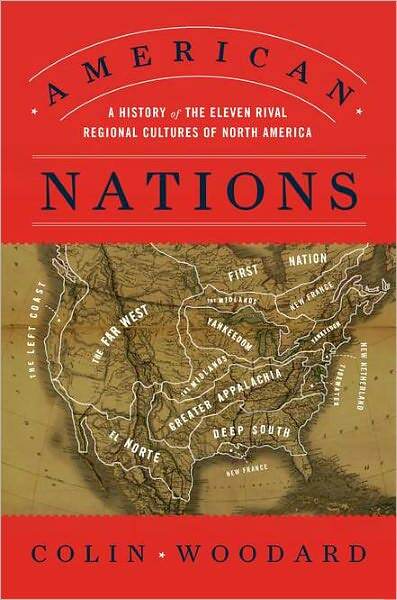 “American Nations” by Colin Woodard looks at things in a different way. His main “actors” in American history are the cultural nations that successfully settled in the various parts of North America. While he is not the first to write about the various American cultures (our own Coralie Koonce discussed Borderers in her book Swimming in a Sea of Ideology), Woodard ties it all together nicely, utilizing earlier works such as "Albion's Seed" by David Hackett Fischer. The USA is not a nation-state like France or Germany, where nation and State borders coincide. The US contains parts of eleven different nations, each with its own cultural patterns and values. By examining the often competing values of the various cultures, we can get a better understanding of history. According to Woodard, trying the understand US history by looking at artificial political boundaries is as futile as trying to understand Africa by looking at colonial borders and ignoring tribes. Yankeedom, settled by the Puritans, had a congregation or town based culture. Freedom to them meant no outside control over their favored collective - the township. So long as people could vote locally, then they were free, according to yankee culture. Within their townships, they could be very authoritarian. Early yankees mutilated and imprisoned Quakers and Baptists. They could and did outlaw alcohol, sabbath-breaking, and other vices. Yankeedom culture allows coercive reform “for the common good.” The yankee culture is very expansionist, in the sense of being “cultural imperialist.” They are not generally militarily aggressive about it, but do it in a smarter, more peaceful, and some would say more insidious manner - through compulsory education of the young. Indoctrination of children into yankee national values remains one of the primary tools of assimilation. Yankeedom has become more secular over time, appealing to utilitarianism in addition to the social gospel. It has also evolved from being localist, to an ideology favoring centralized control, thus amplifying its authoritarian propensity. Tidewater refers to Old Virginia and thereabouts. It was originally settled by and controlled by British gentlemen more or less looking to institute quasi-feudalism in America. Being generally highly educated, their idea of freedom used the classical Greek model. Freedom was all aristocrats participating in a republic supported by a slave majority. Tidewater is small, being cut off from mid-America by Borderers. Greater Appalachia is Woodard’s name for the Scot-Irish or Borderer (also known as “redneck” or “hillbilly”) culture. The original settlers were people from border lands, usually the hills, who got hounded out of the British Isles. They had been fighting oppressors for many generations, so the culture was geared toward armed conflict. They were the perfect buffer between the effete Tidewater gents and the savage indians. Borderers are clannish and hold “honor” as an important value. Their idea of freedom is lack of outside control over their clan. Like the yankees, they didn’t have a modern libertarian notion of freedom as self sovereignty or individual rights. Woodard, annoyingly to me, repeatedly uses the term "independent" when describing Borderers, when obviously he really means the near opposite "clannish." This misunderstanding is surprising, since elsewhere in the book he does make the distinction between (what he calls) the European notion of freedom and the Roman notion of liberty. New Netherland is the smallest nation, consisting basically of New York City and nearby mainland. This was settled by Dutch political entrepreneurs and associated merchants and traders. The Dutch were the ultra-“capitalists” (really mercantilists) of the 1600s. Anyone who wanted to buy and sell goods was welcome in New Netherland. It was and is tolerant, but only in the strict “live and let live” sense. On the other hand, it was even more aristocratic than its Tidewater counterpart. Dutch “poltroons” literally tried to set up a feudal system on the New York mainland, expecting their descendants to collect quitrent forever. The Midlands was originally settled by Quakers, who (unbeknownst to Woodard) had a successful anarchist society in Pennsylvania in the late 1600s. Later an influx of all types of people from all over Europe, especially Germany and Scandinavia, occurred. This multiculturalism with Quaker influence resulted in a very tolerant culture with a solid skepticism of government. The Midlanders’ idea of freedom is modern. The Quakers’ idea that each person should follow his inner light is, in essence, a theistic formulation of self-ownership, i.e. individual rights. Historically and to this day, Midlanders have been the "middle of the roaders" that tend to break any impasse among other the nations regarding central government policy. New France is disjointed, consisting of Quebec and Louisiana. El Norte is the culture of the southern parts of western US plus the northern parts of Mexico (who really don’t need Mexico City or southern Mexico.) Woodard suspects that El Norte might become a separate State a some point. The Left Coast was settled by many yankees, but also Borderers, Chinese and numerous other peoples. It quickly lost the yankee intolerance and expansionist urge. But the Left Coast does tend to agree with Yankeedom on government authority “for the public good.” If the Left Coast has a distinctive notion of freedom, it may be, like the yankees, of freedom as participation in the political process, rather than individual freedom of action. Finally, the Far West was, and to a large extent continues to be, a colonial possession of other nations’ industrial firms. Woodard characterizes the Far West as “libertarian corporatist.” This would seem an oxymoron, until one sees that this is two sides of the same coin. Those who benefit from corporatism no doubt support it; those who get screwed and oppose such plunder schemes would tend to have libertarian values. Thus, there is a constituency both for and against corporatism. Perhaps because such an internal conflict within a nation doesn't gibe with his theme that nations generally think alike, Woodard frames the "libertarian corporatism" almost as hypocrisy rather than different reactions, by the losers and winners respectively, to the dominating corporatism. Woodard gives a history of each nation, and then shows how their respective national values and culture influenced the Revolutionary War, the Civil War, and even politics today. For example, the Revolutionary War was really five separate and quite different conflicts, with Greater Appalachian people choosing sides depending on local interests. I would say that his explanation works better than standard schoolbook “victors” history. I was impressed that Woodard agrees with me (!) that the US Constitution was a power coup and counter-revolution. He stresses the war scrip scam and its special interests. On the other hand, when we get to the War of Southern Secession, Woodard seems totally unaware that reinforcement of Fort Sumter was a ploy by Lincoln to start a war. Woodard goes so far as to deny that US supply ships were carrying munitions to the fort. According to Woodard, Yankeedom’s expansionism is largely due to what he calls “public” religion, which he contrasts with southern “private” religion. In other words, the Yankees practiced a “social gospel” of bettering mankind, while private theists stressed personal salvation. Woodard sees politics today, and for some time in the past, as basically consisting of Yankeedom and The Left Coast - the Northern coalition - pitted against Tidewater and The Deep South (and often Greater Appalachia) - the Southern coalition. The Midlands are generally the tiebreaker. Voting patterns to this day reflect the different nations. While this national/cultural model works better than standard histories, there are nevertheless some concerns. How valid are Woodard’s archetypes? How can they be “proved” or “disproved?” How long do they stay valid? How do nations morph and evolve? How do other considerations, such as ideas and mode of production, affect this evolution of nations? Woodard has given us a lot to think about in this book! My own beliefs are closest to Midlander, even though by Woodard’s map I live in Greater Appalachia. As an anti-war activist, without a clannish bone in my body nor any notion of insult and honor (I pretty much don’t care what others think), I’m the total reverse of Borderer values, but consistent with Midlander values. The people I know who call themselves “progressives” tend to have Yankeedom values. The recent ORT (Ozark Regional Transit) proposed tax was a quintessential yankee program, with the assumption that getting a majority of a minority of voters to agree justifies using government violence to rob everyone in the county. Yankees are the Borg of Society. “We are Yankeedom. You will be assimilated!” Fortunately for those of us who value freedom, Yankeedom is hanging itself by its own greenbacks. Libertarians and Midlanders may win out after all. Or at least secede.